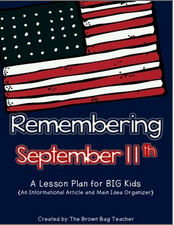 This week in Social Studies I'll be teaching my students about the events of September 11th. Being a native New Yorker, this subject is near and dear to me. That was a crazy day for our country, and not knowing where friends who lived in the city were and whether they were safe on that day was a horrible feeling. My students now were not even born when the events of that day unfolded, but I still believe it is vital for them to learn what happened, and how our lives changed as a result. I found a few resources that I'll be using to teach this week. They are all FREE, so if this is something you may need to discuss with your class, I hope they will be helpful to you as well. One of the great new things I found this year was this printable poster from Messare Clips and Design. I like to put quotes and pictures in frames in my reading corner, and this will be perfect to start the week and get students thinking. 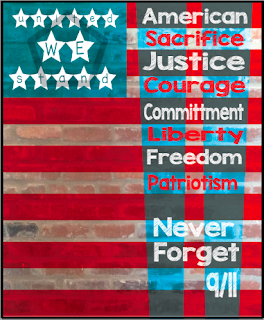 I LOVE how the design subtly incorporates the Twin Towers. A resource that I'm going to use as a reading strategy is from The Brown Bag teacher. I'll be starting to focus on Main Idea, and this reading passage is a perfect companion to that. The graphic organizer is straightforward and an easy start to this skill. The mentor text I'll be using for the week is called The Man Who Walked Between the Towers. While it isn't about 9/11, it is a rich piece of World Trade Center history. I will also be highlighting the following books in my library corner in case students want to read more on the topic of New York, or 9/11. 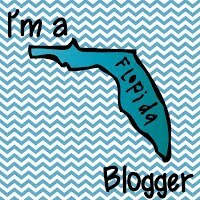 This post contains affiliate links which means Amazon sends me a few pennies if you make a purchase through one of the book links... this simply helps me fuel my book habit. Being a fourth grade teacher, I also show my students a video from Brain Pop on the events of September 11th and we complete a Timeline activity about the events of the day. My students also color ribbons to wear so they remember to talk to their families about the events of this important day of remembrance. 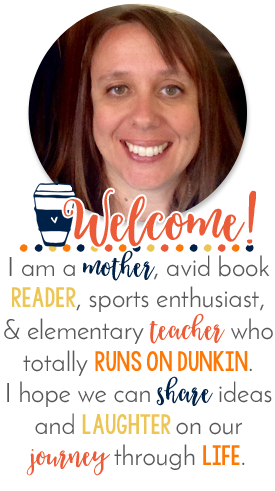 The ribbons are a FREE resource from Erin at Loving Lit, and you can get them <HERE>. I would love to hear how you teach your students about this important day in our American History!